While our current attention is on the Republican Party’s transfer of wealth to the rich and corporations through the charade of a healthcare reform, the Democratic Party needs to face up to its future and the future of our healthcare system in particular. The chart shown here tells you everything you need to know about the outrageous amounts of money we pay versus the astonishingly poor outcomes for our health. Basically we pay twice (200% more) than almost every other developed country in the world for healthcare that is distinctly second rate. The US ranks 56th in infant mortality out of 225 countries; 48th in maternal mortality out of 184; and 42nd in life expectancy at birth out of 224. 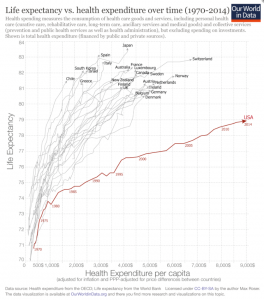 – source Current CIA The World Factbook – https://www.cia.gov/library/publications/the-world-factbook/ accessed 5/13/2017 To put it simply we have a healthcare system that is ripping us off and laughing all the way to the golf course. It is a market system that incentivizes tests, procedures, and prescriptions, not health. It is a market system in which the providers, doctors, hospitals, insurance and pharmaceutical companies set prices as they wish. Our healthcare system consumes just shy of 20% of our economic output. Our developed country competitors use 8%-10% of their output. Preserving Obamacare is not enough to bridge these gaps. Obamacare addresses the lack of access to healthcare in a significant but hardly comprehensive manner. It only hints at changes to the incentives and pricing that drive the unhealthy outcomes. Obamacare is not the solution. Better than nothing, but given the enormous resources being spent and the fundamental failings of the outcomes it is not sufficient. In order to create a world class healthcare system we need to focus it on health not profits. Every other developed country long ago recognized that a market based system would not work because health is not a commodity like corn, cars, or cell phones. It is complex, multi-dimensional, and emotional. It requires a system capable of a holistic approach to people and the society they live in. 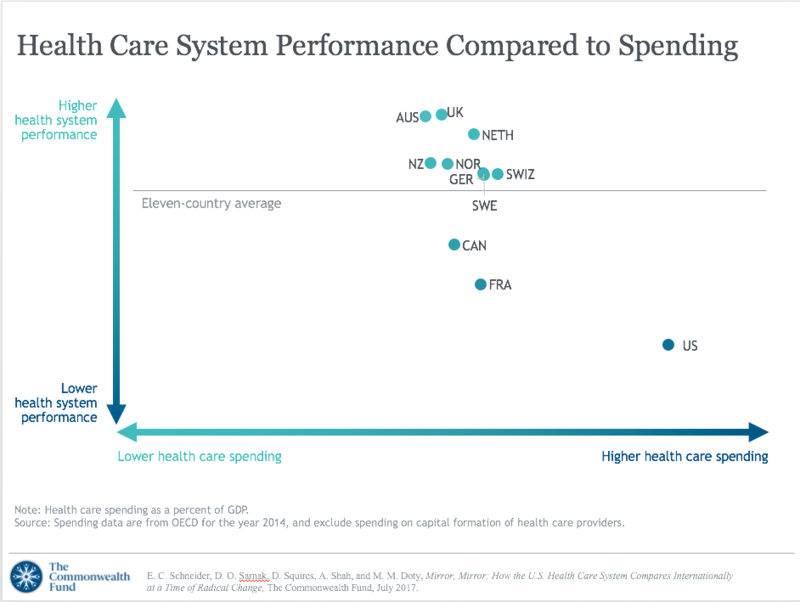 Each of the countries with universal healthcare approaches implementation very differently in the details, but all have some sort of national/regional health budget that is negotiated with the various constituents. This amounts to a lump sum per person with which the health system operates to deliver health outcomes. The proof that it works is in the chart above. The Democratic Party must absorb the reality of our situation. 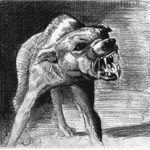 We need to develop and express some outrage at the current healthcare providers. It will not be a simple task to bring a sector of the economy that consumes nearly a fifth of economic output to understand that we cannot allow this to continue. We need them to evolve to a system that consumes a tenth while vastly improving healthcare for the entire population. A basic truth here is that we as a society cannot and should not allow one sector to consume so many resources, so inequitably, for such poor outcomes. In the global context this is not sustainable and makes us less competitive and less flexible to meet the changes. None of this will happen as long as Democrats are taking money from the rich and corporations. If there is a single lesson from the Bernie Sanders campaign it is that with messages and programs that reflect the needs of the vast majority of Americans, you can raise enough money to fight off the Republican Party and its wealthy and corporate sponsors. Time to start now.